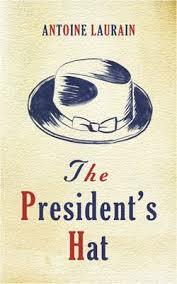 THE hat in question – and in the original French edition – belongs to president Francois Mitterand. It is probably just coincidence that two of France’s notable novels of the last few years have featured the socialist president with enhanced, almost mystical qualities but it underlines the point that French writers are more interested in contemporary political allegories. Mitterand also feaurues as a lynchpin in Laurent Binet’s The Seventh Function of Language. Here Laurain uses a simple fable-like conceit of the missing hat to draw the fault lines through the Gallic political landscape: The horror of old school aristocrats at the rise of socialism at all and the left wing associations not so much with the workers but with artists and the moneyed media. From the quotes that adorn my copy I am not sure English reviewers actually get that point. But as with his Red Notebook, Laurain manages to tell a light hearted tale that mixes mystical powers ascribed to the hat itself and its wearer with a nuanced and structured pastiche of modern society linking a financier to a mistress to a failed perfumer in therapy and finally a businessman each in their own way finding salvation or nirvana in the wearing of the missing hat and draw out an alternative politic. Curiously each of the different characters is voiced by different translators in Louise Rogers Lalaurie, Emily Boyce and Jane Aitken. Chapeau as the French say. Good fun but with a sinister twist at the end. This entry was posted in 101greatreads, fiction and tagged antoine laurain, Mitterand, paris. Bookmark the permalink.